Calling all pet owners! 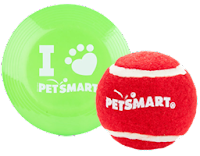 Right now you can get FREE or Cheap Pet Toys at PetSmart! They have many pet toys $2 and under and there is a $2 off ANY Toy PetSmart Coupon that will make them FREE! The coupon is at the bottom of the page and can be printed twice. Here is an example of a toy I got for FREE for my dog, Piper, the last time this coupon was available!